Heather and Matt had inherited a diamond ring, from which they wanted to use the diamond to set into a new dress ring. The 0.82ct diamond was a beautiful old cut diamond and therefore had a wonderful unique sparkle. We set the diamond in an all around setting and then combined it with channel set diamonds and sapphires in the shoulders. Each channel holds a 2mm brilliant cut HSI diamond, a 2mm light blue sapphire and a 2mm royal blue sapphire. 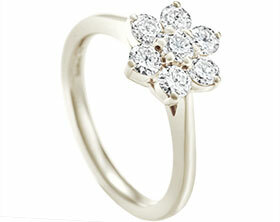 The ring is made from 18ct white gold which highlights the white diamond, and has a highly polished finish.